In the first day of school season in (2014 ) the president of Islamic republic of Iran was expected to attend in a big governmental school in capital’s middle level neighborhood to hold a fairly symbolic old custom and start school season hammering the school bell to announce new school year, but he preferred to authorize this duty to his first secretary and he, himself , participated in a summit about global warming crisis gathering with heads of state and leaders in west of Atlantic .The following article tries to present a purposed analysis of remarks of Iranian president ( Dr. Rouhani ) climate change summit in New York. With invitation of UN In 23th September 2014, while most of world leaders gathered in New York to negotiate about their governmental approaches to safeguard the dangers of extending global warming and world climate change ,a world leader from developing country talk about a new point of view that even developed countries and governments which are pioneers in environmental considerations couldn’t ignore him; This is a big occurrence which if continues as a righteous approach in a strategic planning of his government, it could be a historical center for Iran environmental followers undoubtedly. “The formation of the UN as an international peace strengthening organization has untrue incompatibility with its current identity” President Rouhani tried to prove in his remarks .He reminded that the silence of the world organization against applying bulky sanctions in front of its members, openly jeopardized and scratched the organization true spirit, because these sanctions extend the poverty and these extensions will have the result of exacerbate damage on natural resources and biome ,The process that is obviously increases the procedure of lands’ demolition and will decrease the capabilities of biome and ecosystems and therefore with soaring of environmental unbalances ,there will be more fields for social tensions, violence , immigrations and provide a slack local and beyond local structures. In the other hand, president Rouhani warned that following the increasing wave of economic sanctions against Iran will destroy and raze the target of UN formation, in the heart of UN in presence of the highest authorities of UN. 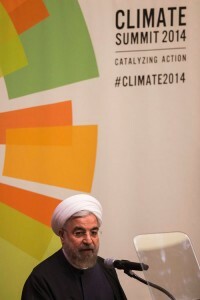 Mean while president Rouhani emphasized that” illegal economic sanctions should not pose of danger to people’s health and environment” .In addition, according to his previous suggestion about “ world without violence “ which was confirmed in UN general assembly , “The rise in the temperature and its negative impact on rain precipitation in the Middle East, the chronic drought and water scarcity has led to an increase in poverty and the occurrence of instability and tensions in the border areas”, said President Rouhani. “Unfortunately, the continuation of political disputes and war in the neighboring countries has become an obstacle in achieving a durable and practical agreement on the resolution of regional environment problems”, he said. He stressed the importance of cooperation among regional countries to solve the environmental problems particularly the global warming crisis. Finally President Rouhani advised leaders to create economical motivation to coordinate with world cooperation in global warming field and added’’ national target with approaches to Decreasing energy intensity, Reducing energy subsidies, Limiting major atmospheric pollutants, Promoting energy efficiency, improving the quality of fuels, despite imposed economic sanctions , we try to increase renewal energy sources and cooperate with our neighbors about dust control and management technology as well. We hope to publish and extend these kinds of reasonable remarks in world communities to have more worthy analysis for Iran’s new doctrine and we hope to add the effectiveness of environmental rules in Iran political literature. It won’t be achieved, but we found some objective signs of sovereignty consideration to eligible governance in the reengineering layout scene of national development. It is an achievement that if happens we can see the increase of annual budget of Iran environmental organization from %0.14to at least %0.5 of national credit. On that case we may know the presence of president Rouhani in New York as a real new approach and a historical event for Iran environmental fans. This is presence that its feedback propagates out of Iran borders and undoubtedly creates a considerable wave of environmental attention among Middle East southwest Asia and NAM members. Its name is Hengam .A beautiful island with exceptional coral bank that is less than 10 km long and 5 km wide and totally it has some 2,500 Iranians residents. A small land which at least lasts to200 years in the shape of island among – Blue – saphier -like waters of the Persian Gulf. However, I want to talk about the fascinating events that occurred in Hengam and impressed my sole. The story comes back to early 2012, when Hussein was crossing a beach road called “ Ghir “ by his blue Nissan van which is- one of the few cars in the island- suddenly he faced with a donkey sitting in the middle of the road and he was blocked the way! As It turns out ,he needs to say something… after getting out of the car , he found out that donkey’s foot is sore and swollen and a piece of metal substance was inside his foot which was an opened can that apparently was thrown away by tourists .Of course Hussein tried a lot to catch the donkey but the injured donkey escaped limpingly (Note that these donkies that was used for transport purposes was abandoned without care so that they live semi-wildly). This scene was forgotten until a few days later somebody informed Hussein that the injured donkey is in school yard. He immediately attend to the school, and as you can see in the following pictures with the help of his colleagues, they caught the donkey and put out the remaining pieces of can from his leg and they wounded his decayed leg and release him to nature. About a month later when Hussein was working in his office… suddenly he heard some noises outside his office which belongs to the mentioned donkey and his friends! All of donkies were injured by metal pieces and had infection and pain in their legs and now they were came into the human who proved that he is a real friend and they can feel safe by him. Ali Bsk on What does Parishan’s self burning tell us? © Copyright 2019 Combating Desertification. All rights reserved.